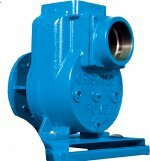 Griswold is a leader in centrifugal pump design and manufacturing. The company’s product line is idea for the safe transfer of fluid in the energy, process, and water/wastewater markets. The companies ANSI centrifugal pump is ideal for chemical processing, pulp and paper, mining and other demanding applications. In addition, Griswold manufactures a world class end suction product line for the water and wastewater market, including: water parks, commercial swimming pools, water treatment, HVAC systems and much more. 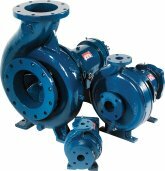 The Griswold 811 series ANSI pump is widely used for nearly all process applications. The 811 is versatile and used throughout chemical, water treatment, food processing, oil & gas, pulp and paper, power generation applications, and more. The pump is compliant with the ANSI B73.1m standards and is available in 316 stainless steel, Alloy 20, ductile iron, and CD4MCu materials of construction. The 811 has a max flow capacity to 7,500 gpm and total head to 920 ft. The ANSI centrifugal pump can also accommodate fluid temperatures up to 500 degrees F.
The Griswold E, F, and G series centrifugal pumps are some of the most popular water pumps on the market. The pumps are available in a wide range of configurations and sizes to fit most water and wastewater applications. The pump is an end suction configuration and is available in self-priming models with closed coupled options. The Griswold water pump series has a flow capacity to 3,000 gpm with max pressure to 134 psig. 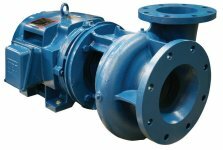 Griswold offers self-priming centrifugal pumps for a variety of applications including dewatering mines and underground storage facilities, swimming pools, fountains and other water uses. The pump can handle flow rates up to 350 gpm. Griswold is a worldwide leader in the design and manufacturing of ANSI process, industrial, and water centrifugal pumps. The company is a part of the Pump Solutions Group (PSG) and is located in Grand Terrace, California. Griswold has manufacturing facilities in France, Germany, China, and India, as well as other locations across the US. Griswold centrifugal pumps are found all over the world in powering generation, oil and gas, water parks, chemical plans, zoos, aquariums and much more.